DRI contacted Dr. Cory in 2006 to ask if NextLeather could be labeled as leather in the US. Without a physical sample, Dr. Cory responded, “ABSOLUTELY NOT!” be labeled as leather and that it would have to be called “Bonded leather,” “Reconstituted leather,” or “Not leather” under the applicable FTC regulations. Dr. Cory offered to have his lab perform a chemical analysis to determine the percentage of leather fibers used in NextLeather, which was a requirement for labeling bonded leather under FTC regulations. 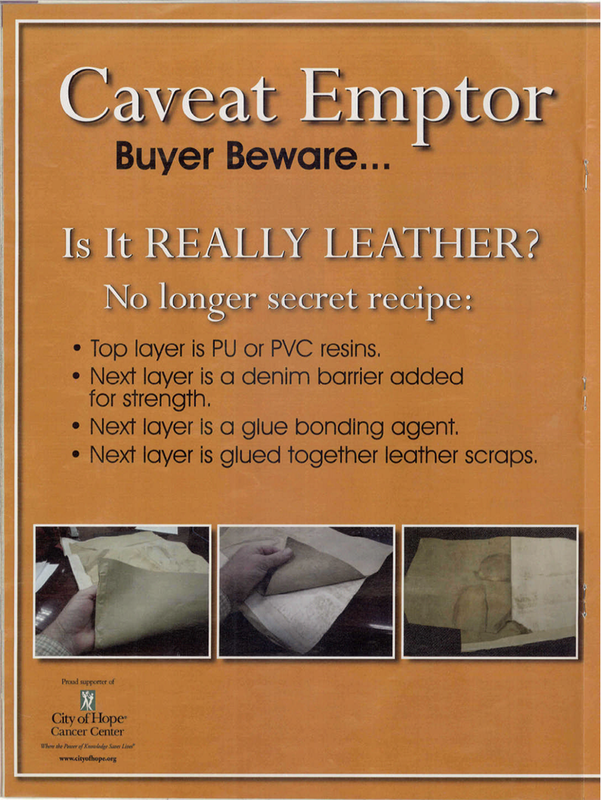 In 2006, defendant Ashley began running ads with the caption “Caveat Emptor.” One asked, “Is It REALLY LEATHER?” The said “[s]ome upholstery suppliers” were “using leather scraps that are mis-represented as leather; adding a denim barrier to this material and using it for bicast, and as corrected grain leather in locations where you would expect top grain.” The ad concludes: “Know What You Are Buying” and “REMEMBER … The Overseas Manufacturer Has NO Liability In The U.S.A. YOU DO!” Ashley contended that it wasn’t aware that DRI sold bonded leather until over two months after the first ad ran, and also argued that its ad was referring to a Chinese product consisting of “glued-together leather ‘scraps’ for backing material” as opposed to NextLeather’s “ground-up leather ‘shavings.’” DRI nonetheless argued that the ad specifically targeted it and accused it of violating the law, at a time coinciding with a criticial industry meeting where retailers make many purchasing decisions. In 2007, Ashley asked Dr. Cory if it could market and label a bonded leather product similar to NextLeather as bonded leather. Dr. Cory responded it would be deceptive to label such a product as bonded leather. At Ashley’s request, Dr. Cory conducted an interview with Furniture Today to warn of the potential confusion from labeling these new products (consisting of leather scraps glued to the underside of a synthetic cover) as bonded leather. DRI’s claims against LIA stemmed from two Furniture Today articles. One was by Joan Gunin, titled “Chemist fears confusion over imitators may hurt category.” The article states: “‘To call it “leather” is outright deception, outright fraud,’ said Cory, director of the Leather Research Laboratory at the University of Cincinnati, of bonded leather. ‘It’s not real leather…. It’s a synthetic that has leather fibers glued to the underside.’” The other was by Susan M. Andrews, titled “For consumers’ sake, let’s not call it ‘bonded leather.’” Dr. Cory is quoted as stating “calling these products bonded leather ‘is deceptive because it does not represent its true nature. It’s a vinyl, or a polyurethane laminate or a composite, but it’s not leather. If you tar and feather someone, does that make them a chicken?’” Dr. Cory didn’t refer to DRI or NextLeather by name, but one article mentioned an unaffiliated product, Oekopelle. Furniture Today published at least 13 other articles about bonded leather during this period, none quoting Dr. Cory but many focusing on the deceptive nature of the “bonded leather” label. Meanwhile, in 2007, the FTC requested public comments on its Leather Guides, which provide that “[a] material in an industry product that contains … bonded leather and thus is not wholly the hide of an animal should not be represented, directly or by implication, as being leather.” LIA submitted comments seeking to clarify whether the practice of adhering leather fibers to the bottom of a synthetic product (as opposed to leather fibers glued together to form a continuous layer) could be marketed as bonded leather. In 2008, the FTC declined to change the Leather Guides, concluding that their provision requiring disclosure of the leather fiber content gave adequate information to consumers. DRI argued that the necessary implication of Dr. Cory’s statements was that it was deceptive and fraudulent to sell bonded leather as such because the phrase contains the word ‘leather.’” But this wasn’t a necessary implication. DRI then argued misleadingness, claiming that “many [customers] refused to purchase bonded leather due to their perception that they could face legal liability for selling it.” But the evidence—two depositions—failed to show consumer confusion. One deponent, Silver, testified that consumers generally “weren’t confused about the product [bonded leather],” but “[retailers] got this controversy and stuff in the thing you’re being deceptive. They didn’t want to get involved in it.” His references to confusion about bonded leather didn’t link Dr. Cory’s statements to confusion. (As stated, that’s an error of law: the question of whether the statements were misleading concerns whether the statements would likely confuse a reasonable consumer. If similar statements elsewhere caused DRI’s harm, that’s a damages issue; it doesn’t make these statements not misleading.) Regardless, even testimony about one retailer, Macy’s, being confused wasn’t enough to show that Dr. Cory’s statement misled a “substantial portion of consumers.” The other deposition didn’t identify any potential customer who was confused by or based a purchasing decision on Dr. Cory’s statements. Summary judgment for LIA. Again, there was no necessary implication that it was deceptive and fraudulent to sell bonded leather as such because the phrase contains the word ‘leather.’” Even assuming that Dr. Cory was offering a legal conclusion about NextLeather’s labeling under the FTC Guides, “[a]bsent a clear and unambiguous ruling from a court or agency of competent jurisdiction, statements by laypersons that purport to interpret the meaning of a statute or regulation are opinion statements, and not statements of fact.” Dr. Cory spoke while the FTC was considering the issue, so summary judgment was also appropriate with respect to this article. 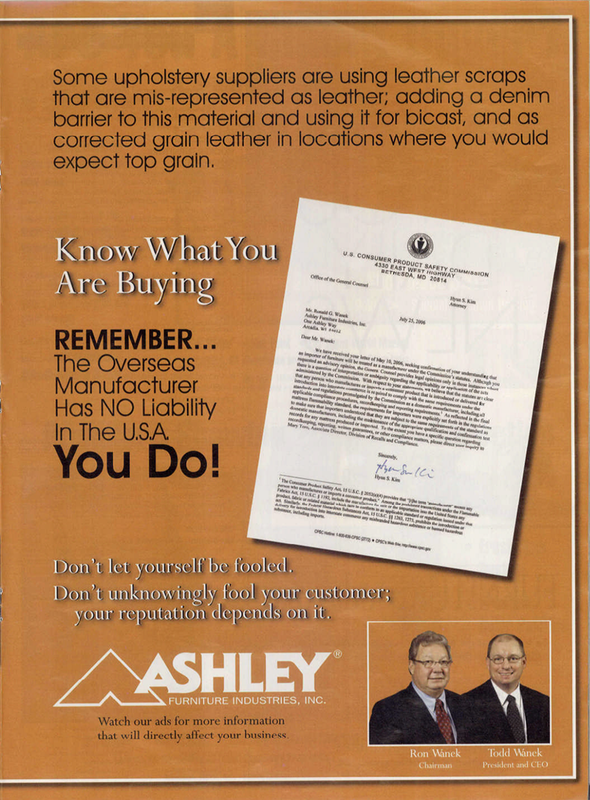 Ashley’s Caveat Emptor ad: DRI again argued falsity by necessary implication because the ad warned potential purchasers of bonded leather to be aware of “leather scraps that are misrepresented as leather,” but DRI never labeled NextLeather as leather alone. But this argument rested on the unproven assumption that Ashley’s reference to bonded leather referred specifically and exclusively to NextLeather. To reach DRI’s conclusion, the reader would have to infer that the ad referred to “bonded leather” instead of bicast or similar products; a Furniture Today article so characterized Ashley’s ads (“Ashley is urging buyers to ‘be aware’ of bonded leather.”), and an expert report indicated that informed readers of the ads understood them to be about bonded leather, but the Furniture Today article explicitly mentioned a number of other companies making bonded leather. Given that explicit falsity requires that a reader “recognize the claim as readily as if it had been explicitly stated,” the leap to NextLeather was too far. Nor could DRI prove implicit falsity. Deponent Greenfield said that Ashley’s ads “opened our eyes” and that “everyone was talking” about the ad/bonded leather, but he viewed the ad as Ashkey’s opinion. And he didn’t link bonded leather to NextLeather in a way that indicated consumers would perceive them as synonymous. Silver did testify that the ad was misleading and frightened people into not buying, but didn’t identify any specific potential customer who was deceived, and he admitted that he didn’t know about other furniture industry companies’ operations. Summary judgment for Ashley. The state law claims similarly failed, whether analyzed under North Carolina or Washington law. Among other things, DRI didn’t show that the Ashley ads proximately caused a legally cognizable injury to DRI’s business. DRI also alleged negligent misrepresentation on the theory that by providing advice via email to DRI, Dr. Cory owed DRI a duty of care in rendering such advice that Dr. Cory breached by: (1) “failing to disclose and concealing his allegiance to his other clients and the leather manufacturing industry members of LIA”; (2) taking a “public position contrary to the advice he had given to DRI”; and (3) “calling DRI a fraudster after it followed his advice.” But there was no authority for the proposition that “a testing facility owes a legal duty to refrain from expressing opinions (arguably) contradicting advice given to a prior client.” Without a legal duty owed, there could be no claim. This entry was posted in ftc, http://schemas.google.com/blogger/2008/kind#post. Bookmark the permalink.